Jim Lahey, owner and baker at Sullivan Street Bakery in New York City, devised a recipe for making bread using a very wet dough in a Dutch oven that he contrived to replicate the conditions of a professional steam-injected bread oven. And on November 8, 2006, when the New York Times published Jim Lahey’s recipe for No-Knead Bread in The Minimalist column by Mark Bittman, it was a revelation. It turned out, it was a revolution too. My Bread by Jim Lahey was published in 2009. Since then his original recipe has been reworked countless times; numerous cooks have adapted his method and written their own books based on it; and plenty of people now bake their own bread at home. In my enthusiasm, I got a number of other bread books, but My Bread is the only one I needed to find what has become my own weekly loaf. After adjusting the recipe using different sizes and shapes of pots, I have figured out what works best for me. It hinges on using a specific pot, the Italian Baker (formerly known as The Long Baker) by Emile Henry. 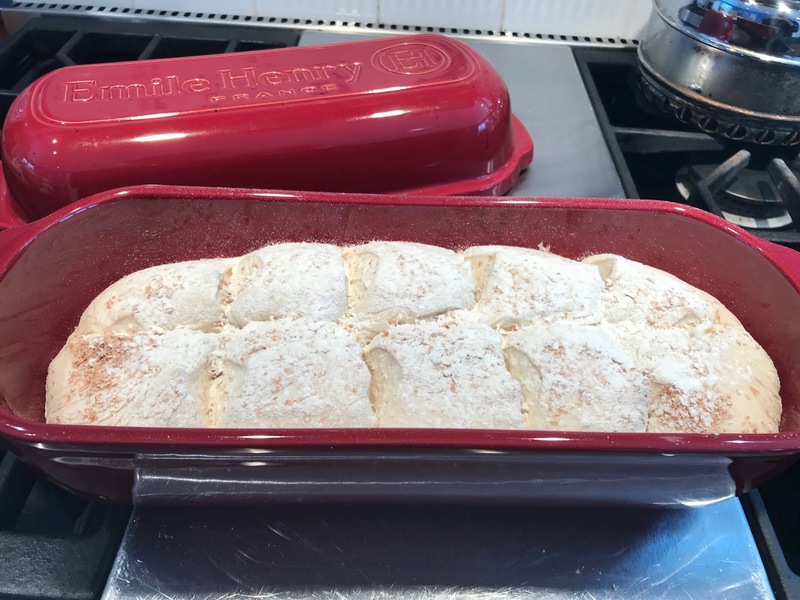 It makes a long loaf, which is especially good for sandwiches and toast - and if tea and toast isn’t the most perfect combination, I haven’t found it. The first thing I did when I got the Italian Baker was write to Emile Henry to find out if I could preheat the empty Italian Baker in the oven before putting room temperature bread dough in it. The pot is made of Burgundian clay, not part of the Emile Henry Flame Collection, so I wasn’t sure. And even now I, myself, can’t represent to you that it is okay to do that. I can, however, share with you the following response I received from Karla Stears, the corporate chef for Emile Henry on January 17, 2018, and based on this email I have been doing just that when making my loaf of bread. So have two of my friends. You are correct, the Italian Baker is not part of the flame collection but luckily you ARE able to preheat the Baker in the oven and then add your room temperature dough. 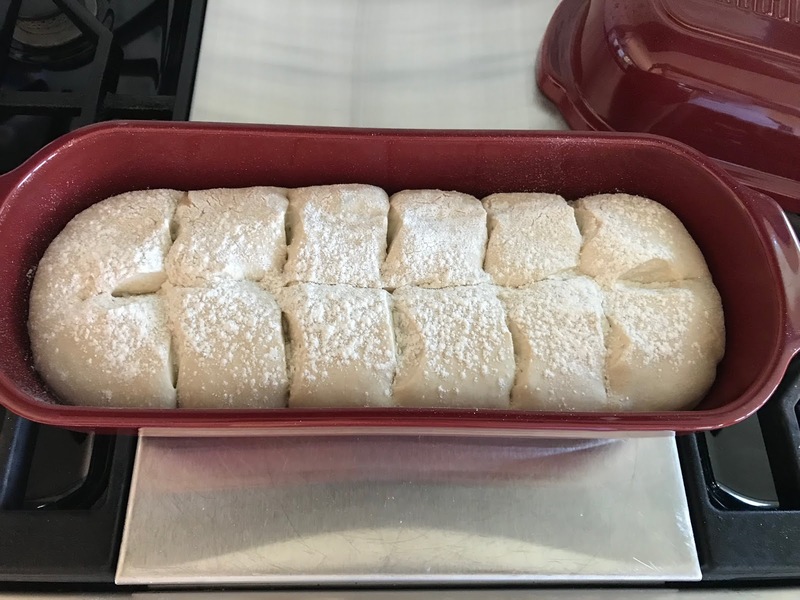 I started out with the first recipe in My Bread and by trial and error adapted it for use in the pot by increasing the bread flour from 400 to 600 grams and making the other ingredient adjustments accordingly. I did up the percentage of salt but not by a lot. Don’t be alarmed at how long it takes from the time you start until you have a finished loaf of bread. All you do is assemble and mix everything together. After that, the ingredients and time do all the work. You just have to figure out a routine that works with your schedule. The first rise of the bread takes from 12 to 18 hours. I have found that a little more than 18 doesn’t do the dough any harm, especially if the temperature is cold. However, the second rise is 2 hours, and I find that it’s better to stick as closely as possible to that timing rather than letting it sit in the banneton much longer than 2 hours. The amount of time that I bake it for works well for me in my oven, which is a 36-inch Wolf Dual Fuel. My neighbor found that the bottom of her loaf burned if she baked it as long as I do so she has reduced her cooking times to 25 minutes top on and 10 minutes top off. See how yours works out, and adjust if necessary. The internal temperature of the finished loaf should be at least 209°F. Learned by watching and testing from Great British Bake Off Master Class: We all use instant yeast now, so add it to one side of your mixing bowl with the flour and other ingredients and the salt on the other side. Salt, when added to the bowl on top of the yeast, weakens and kills those necessary little critters. Put the flour, salt, and yeast in a large bowl, and stir with a fork to combine. Add the cool water, and using the handle of a wooden spoon, mix it all together. (I like using the handle of a wooden spoon more than a Danish whisk for this task). This will take a few minutes, but it will come together. Cover the bowl tightly with a piece of plastic wrap. Let sit in a warm(ish) spot for 12 to 18 hours. I like to do it the night before I plan to bake and leave it overnight on the stovetop with the hood lights on. Put a linen tea towel in your banneton and sprinkle the bottom with a little flour and a little wheat bran if you have it. 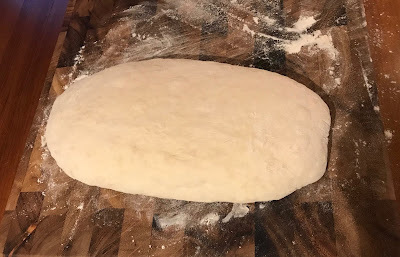 Put a little flour on a wooden board and using a plastic dough scraper (mine is from King Arthur Flour, and I like it), turn the very sticky dough in the bowl out on it. Fold it into a rectangle, as if you were folding a piece of paper to put into an envelope. Then turn the dough in the other direction, and fold it the same way again. You can add a (very) little amount of flour to your hands as you do this because the dough can be sticky, but don’t add too much as you don’t want to add more flour to the dough. Make sure you have patted it into a rectangle (a little oval-ish), not a square, and place it seam side down in the banneton. Sprinkle a little flour over it and a little wheat bran if you have it (so the tea towel doesn’t stick). Fold the linen cloth over it, and let it sit for two hours. It will expand to fit the banneton. At the end of the two-hour second rise you want to bake it in a preheated 475°F degree oven in a preheated pot. I count on it taking 45 minutes for my oven to reach that high a temp, and I always put the Italian Baker into the oven 10 minutes after I turn the heat on. To be clear, one hour after the dough has been turned into the banneton, I turn on my oven, and 10 minutes later I put the (naked) Italian Baker in the oven. When you are ready to bake the bread, very carefully – because it is so hot - take the Italian Baker out of the oven, closing the door so it doesn’t lose too much heat. Remove the lid, and holding the tea towel tight, turn the banneton upside down over the Italian Baker so the dough plops in. If some sticks to the sides, just nudge it with a silicone spatula, and it will pull right off. Now it's time to score the bread. I find it easiest to do this with kitchen shears instead of a lame, and the one I like best is by Kuhn Rikon. If you look at the picture directly above, you will see how I score it. I snip it right down the middle and then snip side to side. Put the lid on the Italian Baker, and bake for 30 minutes. At the end of 30 minutes remove the lid, and bake for another 15 minutes. Remove the loaf from the Italian Baker as soon as you take it out of the oven. One or two silicone spatulas will help with this. Cool on a rack before slicing. If this all sounds like a pain, it really isn’t. Like driving a shift stick, it will become second nature. I bake the bread, then slice it, put it in a plastic bread bag, and slip it into the freezer. King Arthur Flour has plastic bags sized for loaves of bread, and I use those. I toast the slices lightly for sandwiches and darker for toast. Pieces of this bread toasted and cut in half are lovely to serve with cheese. 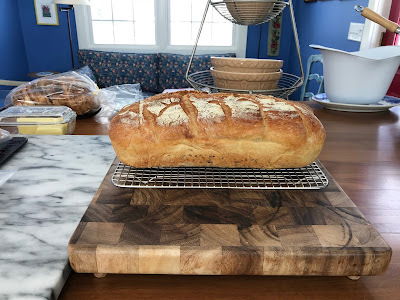 If I want to make two loaves of bread, I mix a second batch of dough an hour later than the first one and bake it as soon as the first one comes out of the oven. For this reason I have two bannetons, but I do not have two pots.